Do you remember the last time you felt so connected with the work that you’re doing? You’re so engaged with your task or your activity that time doesn’t seem to matter anymore. You’re so inspired, challenged and fulfilled with what you are doing that you lose track of time and other distractions from your surroundings. You don’t even feel hunger, fatigue or sleepiness. Maybe it was the last project you headed. Maybe it was a piece you were writing, composing, coding or crafting. It can be something mental, such as solving a mathematical equation. Or it can be something that makes use of your hands, such as cooking or carpentry. Whatever that is, the result is outstanding success. Most likely, you were in a state of Flow. Some people may translate that as being in the zone, or in the groove. Or, simply, “being happy.” However, don’t be surprised if you can barely remember the last time you were in this state. With the fast-moving manner of working and living today, it can be difficult to concentrate on just one thing and to let go of everything else that calls your attention. The state of Flow is similar to meditation. When you meditate, you reach a state of heightened awareness, focus and harmony. By practicing meditation, you are opening your mind and body to achieve the state of Flow when the opportunity arises. However, meditating on your own can be tough, especially if you’re used to a busy, hurried way of life. 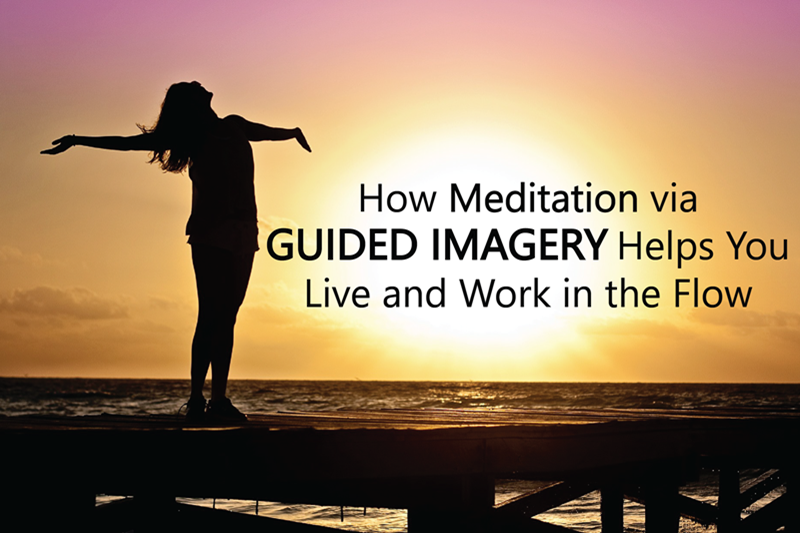 Guided Imagery helps you transition into a quieter state of mind so you can be still and be mindful of your internal processes even for just a while. The step-by-step spoken guidance during Guided Imagery acts as your path to a deeper level of relaxation, clarity and positivity. Achieving a state of Flow is not a privilege. It’s necessary for survival and your wellbeing. To work at something that matters most to you and benefits from your deep involvement is the only way to truly live. Moreover, it’s not impossible to achieve Flow even with the daily distractions and worries. Meditation through Guided Imagery can help you come closer to this state of optimal experience.